We also offer Glass Working Eyewear from Split Lens Frames and Metal Frames, to Clip-Ons, as well as, Safety Reading Glasses, Optical Safety Glasses, Glass Safety Glasses, and Fitover Safety Glasses. 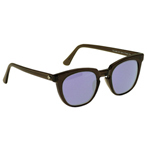 Phillips Maxx is a stylish, lightweight, and comfortable wrap-around plastic sun glass style frame. The Maxx Wrap's biggest attribute is how it's designed to hug the contour of your face blocking light from all angles. 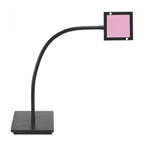 Bench Mount Shield is equipped with a gooseneck swivel for repositioning the filter glass. 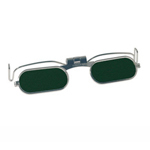 Instead of glasses, protect your eyes with a large viewing area of 4 1/4" X 5" filter glass. 202 Amethyst Contrast Enhancer (ACE) is an advanced version of the rose didymium glass filtering out sodium glare & enhancing contrast. Metal frame that clips over temple part of glasses. Cobalt Blue lenses available in shades 4-8. 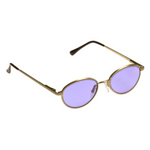 Metal frame that clips over temple part of glasses and covers the top part of the glasses. 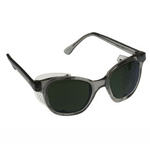 The Economy 70 frame comes in smoke gray, equipped with side shields. The frame has a comfortable fit and has been a safety glass industry standard for many years. 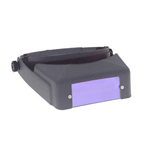 The Economy Torching glasses are lightweight and extremely durable. They come with glass lens and protective side shields. Designed for people who hate goggles and large masks. Supplied with Case & Retainer Cord! 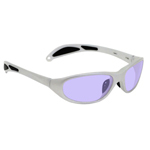 Lightweight and durable providing UV and IR protection for the Scientific Glassblower. They come with glass lens and protective side shields. Designed for people who hate goggles and large masks. Supplied with Case & Retainer Cord! Designed with comfort in mind, the Phillips Visor can be worn over safety glasses or eyeglasses. The adjustable headgear fits all sizes and makes the Phillips Visor easy to wear. Also available with a green welding shade. 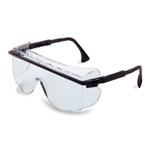 Designed with comfort in mind, the Phillips Visor can be worn over safety glasses or eyeglasses. The adjustable headgear fits all sizes and makes the Phillips Visor easy to wear. Also available with a green welding shade. 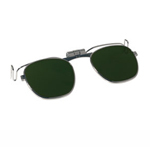 Plastic Green IR fitovers add IR protection while wearing over regualr prescription glasses or over didymium glasses. This sophisticated look comes with spring hinges and removable side shields. Very stylish and extremely durable.